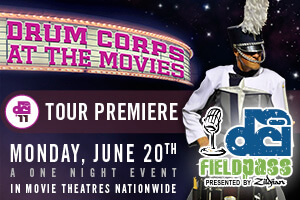 Last year's top eight corps will premiere their 2011 productions this weekend in a historic first for drum corps: Two nights of head-to-head match-ups at the start of the season where anything is possible. Even the order of performance will get flipped on its head. And all of it will be captured as it unfolds by hi-def cameras broadcasting to more than 400 movie theaters across the country the very next night. As we hear in today's Field Pass presented by Zildjian, it's not only the corps who might be feeling a little anxious about the opening weekend. The pressure is on the broadcast team too. Director Tom Blair and co-host Steve Rondinaro tell Dan Potter what they've got in store for Monday's 2011 Tour Premiere cinema broadcast, and more about how you can attend this first-ever event. Learn more about this cinema event and find a theater in your area.